Pear shape diamond beauty precedes its modern popularity. Its eloquence, sheen, and cut are sought by collectors. Its high concept of symmetry and facet placement have made it a great selection for celebrities, museums, and common consumers. 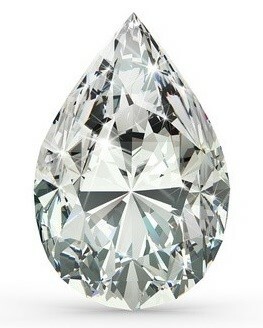 The pear shape diamond was first crafted in 1400 by Lodewyk van Berquem. His introduction to the cut was widely applauded for its innovative shape, though the cut’s popularity was, at first, hindered due to common dislike of its creation process. Pear shaped diamonds, historically, have lost much of their density during creation processes—making the shape expensive during creation. Modern technology has fixed this problem, making the diamond shape more affordable. Modified, brilliant pear shaped diamonds contain a hybrid marquise and round shape. Each pear shaped diamonds contain a tapered point on its topmost end, and they’re commonly worked in a narrow-end-down fashion. Commonly, marquis shapes are available in many varieties—ranging from slim to wide. Pear shaped diamonds are often worn on the finger to increase perceived finger length. Their excellent symmetry and rounded apex have facilitated a unique style—and many fix pear shaped diamonds into fixtures containing symmetrical curves and shoulders. Rounded tops are commonly semi-circular, and different cuts may be added to an increased perceived girth, providing a squared off appearance. Where color is concerned, pear shaped diamond evaluation is subjective. Often, warmer colors—listed between G and H—carry perceived higher value, due to the pear shaped diamond’s light capturing capabilities. Often, premium prices are directly attached to stones labeled within high-end color scales. Clarity, meanwhile, is similarly perceived by the individual’s standards. Longer pear shaped diamonds typically maintained reduced clarity at their points, however, due to the gem’s sharp faces. Often providers assist purchasers with clarity grades, as flawless appearances are often contingent upon a pear shaped diamond’s apex angles—which are not easily gaged by common purchasers. Evaluation in general relies heavily upon both color and clarity, as cut is given within the gem’s pear shape. Again, customers often apply a pear shaped diamond to the provider’s grading criteria. Many pear shaped diamond alterations exist, though few stray far from the diamond type’s main shape. Pear shaped diamonds are considered high end shapes, due to their increased price and non-traditional grading scales. Prices often fluctuate based upon the diamond’s apex and topmost faces. Additionally, clarity may be directly affected by a pear shaped diamond’s overall size.